Netflix’s inspirations for original series “Narcos” spoke in William’s Fieldhouse. Jacob Thomas photo Steve Murphy and Javier Peña speaking to UW-Platteville students. 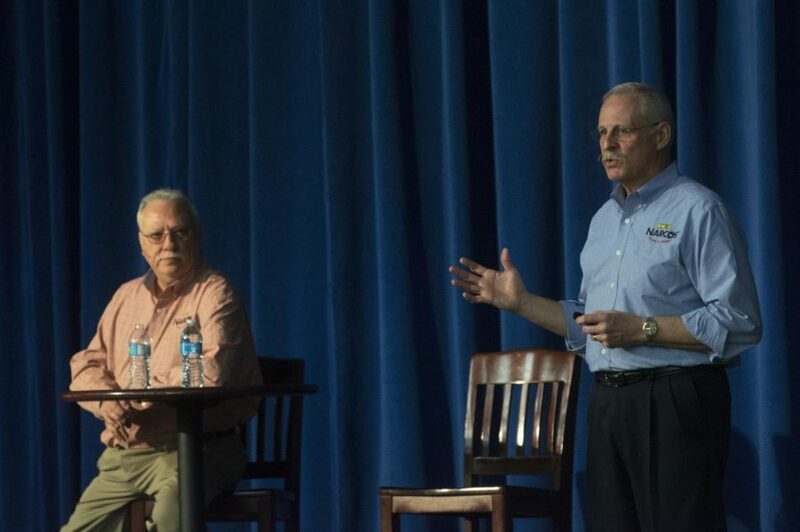 On March 27, Former DEA agents Javier Peña and Steve Murphy spoke at the Williams Field House about the hunt and death of Narco-terrorist and Colombian drug lord Pablo Escobar. The presentation lasted over an hour then was followed by a 30-minute question and answer session and a meet and great in Heritage Hall at the Markee Pioneer Student Center. One of the first questions that was asked was how accurate Netflix’s show “Narcos” was from the original story. Steve Murphy divided up their portrayals and the events that occurred into thirds. Murphy and Peña were then asked what they wanted the audience to take away from their presentation. “We want to emphasize that this is not a career path you want to get into because the only way out of drug trafficking is a bullet to the head. 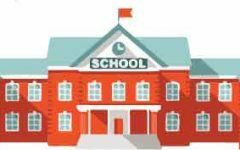 The content varies depending on the audience because we speak with not only colleges, but at high-schools too. Pablo Escobar was unfortunately apart of our history because he was one of the most notorious drug lords out there,” explained Murphy. “Escobar was nothing more than a manipulative, murderous terrorist. He had car bombs planted to blow up buildings, planes, and declared war on Colombia almost three times,” Peña said. Lastly, they want to make sure that they were not the ones given credit for the capture of Pablo Escobar. They don’t feel they deserve the title of “American Heroes” because the real heroes were the Colombian National Police because they pinpointed and defeated Escobar. Peña and Murphy both shared how “Narcos” has given them a platform to not only share their story but their anti-drug message too. This concluded the pre-presentation interview which was followed by the lecture. Murphy and Peña went into detail on how Escobar utilized fear and violence to prove one point: that he couldn’t be stopped. He bombed shopping centers and put 100-dollar bounties on Colombian police officers. Escobar’s wealth and power fueled his ego to the point where when he “surrendered” to Colombia at his self-run prison, he had on his desk 4 miniature figures of Colombian Soldiers to show off to his friends that he owned in Colombia. They concluded their presentation with the death of Escobar and the statistics of the murder rate in Colombia post-death of Escobar. Steve Murphy and Javier Peña had a signing and photo session, then they headed to Platteville’s high school to speak. After the presentation, Riley Bendorf felt the presentation to be inspiring because he is a criminal justice major. “Steve Murphy started off as small-town cop, but he landed a job in Mami and was a part of the capture of the world’s biggest drug lord. If they could make a difference despite their backgrounds, well so can anyone who attends here,” criminal justice major Bendorf said. The distinguished lecturer series is sponsored by the Pioneer Involvement Center with funding from SUFAC and the Wilgus Fund. To vote for next year’s Distinguished lecturer, keep an eye out for the next distinguished lecturer story survey via school email.